Our employees are what truly make ExecOnline a great place to work! We have some pretty amazing people with many different backgrounds who show a real passion for what we do. Get to know us better through the #EXOFam series, where we’ll spotlight real ExecOnline employees to learn a bit more about them – professionally and personally. 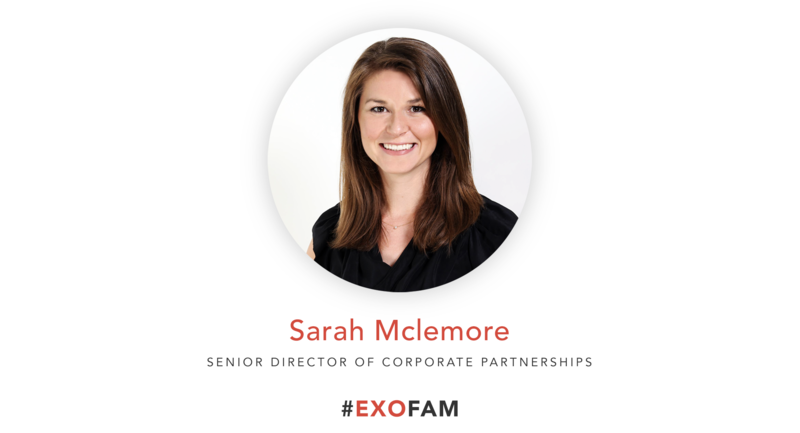 We connected with Sarah Mclemore, Senior Director of Corporate Partnerships, to learn more about what brought her to the ExecOnline family. Sarah joined ExecOnline in early 2015 and is based in our Washington, D.C. office. I’ve been in sales a little over 10 years. I started at another organization in a Business Development Manager role (for our Chief Commercial Officer, in fact! ), similar to the one we offer at ExecOnline today. I’ve sold several products both here and at other companies, and have loved it! What attracted you to ExecOnline as a company? I had a personal connection to Mark Ozer, our Chief Commercial Officer from my last company, and the more he told me about ExecOnline, the more excited I got. We’re growing fast, and have a very cool product – unlike anything else in the market. We are helping our clients solve a leadership development challenge that had previously gone unanswered. In sales, its almost like you are a mini CEO, managing your clients and process like you are running a business within a business. I love that kind of autonomy, but also feeling the support of a great product and team behind me! What’s something that might surprise people about working in sales? Most people are attracted to sales because they say something like, “I’m a people person.” New sales is tough! Bringing on a new client means you are told “no for now” at least 80% of the time. It’s a lot of rejection – but it makes the victories that much sweeter, and once clients get in the door, they love what we do! Haha, no clue. My favorite other internal team at ExecOnline is the Instructional Design team who builds our programs. Maybe that! What are some of the biggest lessons from your career that you’ve brought with you to ExecOnline? Sales is hard because you can’t control a lot of things. Even when someone wants to work with you, something can always go wrong; an acquisition, someone leaves the company, budgets don’t get approved. It can be a bit of a roller coaster. The only thing you can do is “control the control-ables.” Think about why you might not get a new account more than why you would, and hedge against it. For every one deal you think might sign with you, have another three behind it in case something happens. What’s your favorite part of working at ExecOnline? A lot of the things that attracted me here. High-growth company, great product, and great culture where everyone is willing to help each other. I can do the splits! I’ve recently picked up golf – but I also love board games and traveling to cool places with good friends from out of town. Who inspired you to get to this point in your career?